The only way to prevent any candidate Constitutionally unqualified for office from presiding over our Constitutional Republic is to keep his name off the general election ballot. True, as I explained in NEVER LESS THAN a TREASON (1 of 2) and (2 of 2), technically, this made no sense. First of all, while citizens in most states have designed their ballots so that the only names to appear for the top jobs are the Presidential and Vice Presidential nominees of the political party, in fact, we only elect Presidential Electors in the general election. (That’s why sometimes you will see me refer to that contest as the general (Electors) election.) And the Constitution permits these Electors to vote for anyone they want, even someone who lost the party nomination. (This only makes sense since the Constitution is silent as to political parties.) (Sure, some states enacted laws saying, the Electors must vote for the nominee of the party but, as I pointed out previously, no ‘faithless’ Elector has ever been disciplined for breaking the law; and no vote of Electors has ever failed to receive Congressional Certification just because a state Elector violated an oath to vote for the nominee of the party.) Nevertheless, I assured you, enacting and enforcing state election laws to keep Constitutionally ineligible candidates off November’s Presidential (Electors) ballot would prevent Electors from exercising their discretion to elect a Constitutionally unqualified candidate in December because as long as people mistakenly think they vote for President in the general election, Electors would never dare to vote for someone whose name had not appeared on that state’s ballot. All right, so what is the NPVI, anyway? The National Popular Vote initiative is a lobbying campaign funded by John Koza, an engineering professor at Stanford University, that aims to make the Electoral College irrelevant without going through the arduous process of amending the Constitution. States are asked to enact laws pledging their electoral votes to the winner of the national popular vote, no matter who wins the state. The pledge takes effect only when states holding at least 270 electoral votes — a decisive margin in the Electoral College — agree to participate. That would ensure that the winner of the popular vote would take the election. Like I said, in order to understand how the changes to the function of the Electors proposed by the NPVI will adversely affect the integrity of the Presidential election, you first need to understand the role of Electors in that election. 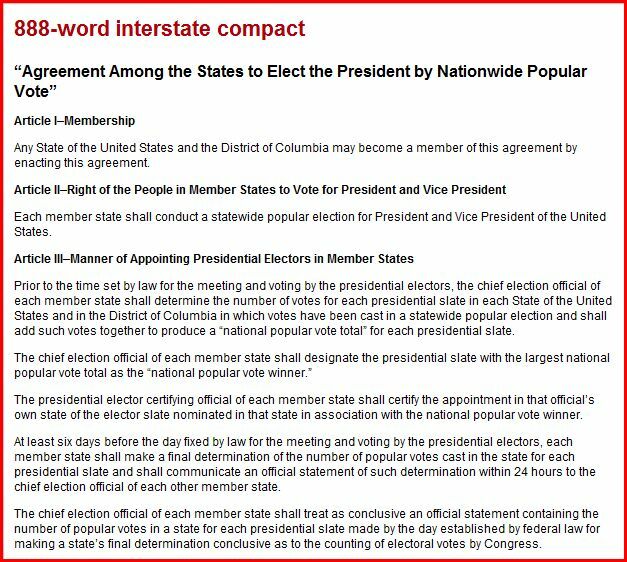 Okay, so the NPVI proposes some sort of legal compact among several states which will govern the conduct of their Electors in relation to the national popular vote. 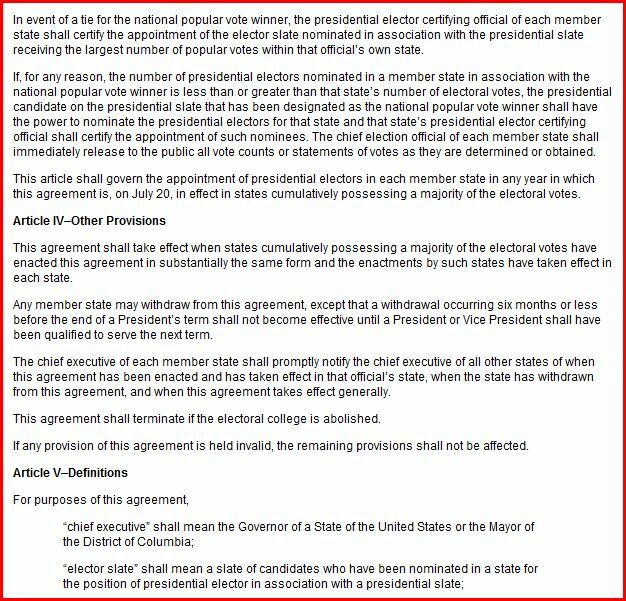 Here is the text of that compact, posted on the website of National Popular Vote.com. The literature is already filled with well crafted opposition. For example, there’s the practical problem of recounts. David Lublin, a professor of government at American University, raises yet another concern: Chaotic recounts. Precise vote tallies don’t matter much with the Electoral College; winning a state with 51% is as good as winning with 80%. But in a national popular vote, losing candidates might be tempted to go to the mat in state after state, demanding recounts or challenging how voting was run. I have several objections to implementing the changes proposed by this NPV compact. Not surprisingly, most of these objections directly relate to the ongoing efforts on this blog to ‘out’ and redress the fraud that tainted the 2008 general election cycle; and to prevent this fraud from ever happening again. See whether you share my objections. Here are some of the reasons I oppose the NPVI. 1. We are a union of individual states, and not of individuals. Therefore, I object to the NPVI’s implicit use of this pretense that we are a Democracy and not a Constitutional Republic in its advocacy campaign. The genius inherent in the system of Electors as it was originally conceived is that it provides a means by which individual states, notwithstanding their geographic size or population, achieve relatively equal per unit weight to each other, in choosing the head of the Executive branch of the federal government. Sure, dividing the population of a less populous state versus a more populous state so as to determine how many people it takes to equal one Elector, shows that less citizens are required per Elector in those smaller states; but on the other hand, larger states have more Electors! 2. Compelling states to adopt the vote tallies that resulted from the use of voting systems they have previously rejected violates the principles of the full faith and credit clause of the Constitution. http://topics.law.cornell.edu/constitution/articleiv Therefore, I object to any law that could compel any one state to adopt the flawed voting apparatus of another state. For example, suppose states enter into this NPV compact. Then, after extensive and expensive investigation, these states become convinced that electronic voting machines produce inaccurate results and, endeavoring to protect the integrity of the votes of their citizens, adopt a 100% paper ballot vote. Other more populous states in the compact vote using these rejected machines. Under the ‘opt out’ clause* in the compact, states would be compelled to defer to the voting protocol they had previously rejected. Effectively, this imposes national standards on the traditional state function of carrying out elections. *Any member state may withdraw from this agreement, except that a withdrawal occurring six months or less before the end of a President’s term shall not become effective until a President or Vice President shall have been qualified to serve the next term. Id. 3. Compelling states to adopt the vote tallies for a particular candidate whose name was omitted from their ballots for failure to establish qualification for office according to the laws enacted in those states; violates the principles of the full faith and credit clause of the Constitution. Id. Therefore, I object to any law that could compel any one state to adopt the eligibility neutral ballots of another state. CA and NY have no ballot eligibility requirement. AL, GA, HI, MD, MO, SC, and VA do. Assuming these 2 (two) large states vote overwhelmingly for one candidate cut from the ballots of those other 7 (seven) states, at least theoretically, Electors in those 7 (seven) states could be compelled to vote for a President who election officials in those states found unqualified to appear on the ballot. Again, this sounds more like a national election, imposing national standards on the state function of carrying out elections. (This same result could occur where states have similar ballot eligibility laws but different levels of enforcement.) (Note: The opt out clause necessarily quashes those existing laws which entitle citizens in certain states to challenge the ballot eligibility of the nominee of the party, chosen at a summer nominating convention that is within the 6-month bar to state withdrawal from the compact.) Id. BUT MY MAIN OBJECTION TO ADOPTING THE NPVI IS THIS: IT WILL BLOCK STATES FROM ENACTING LAWS THAT WOULD REQUIRE ELECTORS TO CAST THEIR VOTES FOR PRESIDENT ONLY FOR THOSE CANDIDATES THEY HAVE ASCERTAINED ARE CONSTITUTIONALLY QUALIFIED FOR OFFICE, AND THE VIOLATION OF WHICH LAWS WILL BE MET WITH STEEP CRIMINAL SANCTIONS. As we here at “jbjd” have learned from experience, such laws respecting the conduct of Electors are necessary to prevent a repeat of events of the 2008 election in which Electors for the Democratic State Parties elected as President a man no documentary evidence available in the public record had established was even a citizen, let alone natural born. Right now, no state has enacted a law requiring Electors to vote only for a President who is Constitutionally qualified for the job. But look at how many states enacted laws before the 2008 election, requiring Electors in those states – remember, Electors are party faithfuls including big money contributors chosen by the party – to vote for the party nominee as a matter of law. http://www.thegreenpapers.com/G00/Electors.html Ha, even states like AL, HI, and MD, which require candidate eligibility to get on the ballot, throw Presidential eligibility to the wind when it comes to the fealty of their Electors to the political party! Id. (Recall that none of these states requiring ballot eligibility has a corresponding law requiring any public official to check.) Even in SC, where the ballot eligibility law requires specific eligibility language to accompany the candidate’s ballot registration; when it comes to the law of Electors, they only have to promise to vote for the party. And what if an Elector violates that oath? Criminal prosecution! Id. John R. Koza received his Ph.D. in Computer Science from the University of Michigan in 1972. He was co-founder, Chairman, and CEO of Scientific Games Inc. from 1973 through 1987. He is the holder of 25 patents in fields ranging from genetic programming to video games, and a venture capitalist. http://money.cnn.com/magazines/fortune/fortune_archive/2008/07/21/105711245/?postversion=2008072111 He founded NPVI in 2005. Id. And where did Dr. Koza get all of this money to fund his pet projects? Well, as the head of Scientific Games, he co-invented the rub-off instant lottery ticket used by state lotteries. http://www.stanford.edu/class/ee380/Abstracts/041124.html That’s right; he invented the scratch ticket. And as the NYT article points out, “Working with state lotteries as chief executive of Scientific Games in Atlanta, he had learned how interstate compacts work. Multistate lotteries like Powerball are based on such compacts.” Id. In sum, for the past 2 (two) years, we here at “jbjd,” operating on a ‘wing and a prayer,’ have been meticulously de-constructing and documenting the fraud that tainted the 2008 election cycle throughout the states in order that having identified and published this fraud, citizens could work with state and federal officials not only to redress that fraud but also to shore up legislation and enforcement mechanisms, efforts which could effectively prevent such fraud from occurring again. On the other hand, since 2006, John Koza, using the windfall he received from inventing the lottery scratch ticket, has been selling his pet project, NPVI, to state legislatures throughout the country, promoting this system that not only fails to address these past problems with the electoral process which we have identified but also effectively ensures, these problems likely will never be exposed or remedied, again. If the requisite number of states pass the National Popular Vote law before the 2012 Presidential election; even keeping the name of an unqualified candidate off the ballot no longer guarantees he will not get the job, unless the courts forestall implementation. This entry was posted on Saturday, July 24th, 2010 at 05:43 and is filed under Uncategorized. You can follow any responses to this entry through the RSS 2.0 feed. You can leave a response, or trackback from your own site. jbjd-Wow this is an extensive article-I read it but I haven’t studied it. Just a couple of things popped into my mind-“if it ain’t broke, don’t fix it” we/they should be working only on the parts that are broken in each state. Each one of our 50 states are so different, we are the United States of America and each state has its own set of positives and negatives, we are not interchangeable. It seems to me the Founding Fathers were very diligent re: balance of power, implementing NVP I think we upset all balances of power by individuals, cities, counties, states and federal and doesn’t NVP sound so good on the surface but when you start digging NVP doesn’t look so good and could creat huge problems in the future. People are not lottery tickets, I’m not much of a gambler but you purchase a ticket $1.00 scratch it off, won/lost whatever-keep/throw away. As we have learned on this blog-people hold the vote-their right to vote as a sacred bond/trust with our government, with a few exceptions Obama/Reid/Pelosi/Bauer-we also hold our fellow Americans vote to the same high standards as our own vote. I think in the end we see how unhappy our country (those who know) they would be more unhappy if they thought an election could be ripped off again and what I think many Americans despise is the smarmy ways these things are accomplished-in dark of night, end runs around the Constitution, skipping legislative processes etc. Lends new meaning to the term “gaming the system”. It may be a game to DC but the people feel exactly the opposite, people do not like to be treated like a scratch off ticket, what are we to them scratch off citizens? I’m beginning to wonder how much contempt DC really has for the citizen-definitely not a good thing nor attitude. I know that you have been very busy this article alone is extensive in its research a new scandal is starting to bubble up it is about the Journolists-suppressing material that would have been damaging to Obama during election cycle-for instance Rev. Wright, so now the “real” journalists are going after this material, I don’t think they are all that innocent either but we will see what shakes out of this latest mess. Some of these scandals, many of us Hillary supporters knew from the beginning looks like others are starting to catch-up and catch on. It’s about time. I think some don’t get it, it is now longer about Hillary or Sarah or DNC, RNC it is about our system and our Constitutional Republic. As I was reading this I remembered something that I read about Albert Speer, Hitler’s architect-he said something to the effect that during that time in Germany we made technology our god and lost sight of any humanity-this Dr. Koza is a numbers wonkish kind of guy-our Founding Fathers were humanists-people persons as opposed to people who think we are just a set of statistics hence a giant conflict. People do not react as if they were merely part of a numbers game, people react emotionally in a way that a scratch off ticket cannot. Michelle: I have read about this journolist group; the news on this first came out several weeks ago now. But I maintain, finding out about BO was not at all difficult. I distinctly recall thinking, if I want to know about BO – and this was BEFORE I realized the press was hiding information – I should examine his foreign policy advisers because if he become the President, these people will likely follow him into the WH. And the thing I cared most about was foreign policy. Guess who was the first person I investigated? Samantha Power, who had advocated invading Israel to establish a Palestinian state. http://www.americanthinker.com/2008/02/samantha_power_and_obamas_fore_1.html More importantly, the press hold no legal privity to us; that is, we share no cognizable legal relationship that would oblige them to give specific performance or would cause us to expect something from them. (I suppose where applicable, people could try to go after an FCC license for failure to live up to some public service requirement… Of course, the President staffs the FCC. Have you read about the proposals with respect to policing the internet? jbjd-just came in from pulling weeds, I am so hot. “And that’s how these people keep stealing elections”. On that same subject: people with no honor, integrity, ethics or morals, this was on our front page of todays Sun-Sentinel. Palm Beach County has an Ethics Commission, an inspector general and reformed measures on public corruption after three former county commissioners and two West Palm Beach city commissioners went to prison amid federal corruption probes. jbjd-yes We are Dist 22 Palm Beach County Fl. I liked Lt Col Allen West and his message early on. Look what I just found, just as an FYI Palm Beach County is huge and a very mixed citizenry. We are Robert Wexler’s old district before a redistricting-then Ron Klein-D who the Lt. Col is running against. Wrong time to be an Obama Dem. Thank you very much for this detailed analysis, and opinion. Call me cynical, but Koza is attempting to concoct a popular vote win to avoid the next ‘Obama’ election eligibility. There is no way these guys are that stupid not to know that the 2008 election was a con pulled on the american public. This is just amazing the implications this could have if it comes to fruition is astounding. What do you believe the chances of this actually happening? I’ll do all I can to spread the word. Once again jbjd, I thank you for all you do, you are truly amazing. DABIG: I know. I kept thinking, the more information I was able to get out about the fraud that occurred in the last election cycle, even IF citizens were unable or unwilling to compel their elected officials to do their jobs, at least they would be prepared in advance next time to file the requisite ballot challenges to stop BO. But now, keeping him off the ballot may not be enough! People have to stop their Legislatures from adopting this measure; and my article contains all of the strongest arguments against, don’t you think? I think it does. Popular vote is also not reminiscent of a representative Republic. Take care jbjd, always good to hear from you. Had to do a double-take after reading the very first sentence above. Talk about “in plain sight”…thanks for sharing another interesting and informative post, jbjd. Back next week to lurk and learn. Also, please point out where I may find Quiz-4–thanks in advance. I can only think of ONE person (or in this case a corrupt organization led by ONE person). But in this case, that would be Obama and his minions. And instead of “shoring it up”, they knew that they had found a ‘gold nugget’ of a loop hole in the system, and GAMED IT big time, beginning with the caucuses. Remember, Obama was a constitutional scholar. He pretty much knew he was ineligible, therefore he had to find that little “missing link” in the constitution (and our election process) that would basically grease the way for him to “hide in plain site.” He probably went out and searched for the actual (legal) definition of the phrase “natural born citizen”, and couldn’t find a DEFINITIVE one. That was his ticket to the WH. Pure and simple. As for the Drudge report… DONE! I just sent the link to your article. Not sure he’ll add it, but he has it. Kelly Canon: Exactly. (‘If we fail to know as much about our political system as those who would use their superior knowledge to steal our power then, they will continue to steal our power.’) The possibility existed to have this Electoral compact in place to award BO the election in 2008. However, not enough states had ratified this in time. This forced BO’s crusaders to defraud the election by using the ballots, that is, swearing to state officials he was eligible for the job in order to get them to print his name on the ballot in states where eligibility is a prerequisite to getting on the ballot. Only, this required a whole meme as to his eligibility. Hence, the on-line advertising campaign, “Fight the Smears,” funded in accordance with the U.S. Code; and the image of the mock-up COLB. In advance of all this, of course, was the selection of Nancy Pelosi to Chair the Convention, to make sure BO and not HRC, would be the nominee. Just to reaffirm, the manipulation of the caucuses, both in terms of locking out major HRC constituencies like single parents; the elderly; the military; and physically challenged (who could not spend hours at night waiting to voice their ‘vote’); and in terms of skewing the allocation of pledged delegates so that more votes were required per pledged delegate in the primary than in the caucus; did not steal the nomination. Think about it: in Texas, the popular vote was close. Even if the pledged delegates had been awarded equally, neither BO nor HRC would have had enough pledged delegates to take the nomination. I posted a link to the Mass story in a thread at CW a few days ago and reminded everyone there that you have been on the front line warning about this. Sorry to say that no one had any comments. This plot is essentially like planting a backdoor Trojan on a computer…in most cases you are not aware until its too let.